-Bruce M. Hill- When current Ulster motor cyclists recall the past and familiar names, the following come to contemplation – Woods, Bennett, Craig, Rusk and Bell – but the name of Shaw is perhaps not as familiar as those mentioned. The reason I believe, is that both father and son were devoted and dedicated to the sport. They gave all they had – they enhanced and enriched the sport, both were outstanding sportsmen in motor cycle racing, car racing and trials and they contributed an inestimable amount to foster their professional skills, not only in Great Britain, but also on the Continent. When they hung up their helmets – that was it, neither sought adulation nor further fulsome praise. Both were modest and retiring – always willing to help those up and coming riders – and primarily, both had a motor business to maintain in central Belfast. The competitive era was over; they retired gracefully and got on with their business. Yet, from the beginning of World War 1, until the thirties, the name of Shaw was a household word – Jimmy Shaw served with distinction as a pilot in the Royal Flying Corps in World War 1 and it was there that he formed a life long friendship with a young man – W E Cotton – “Billy”, showman and band leader (became a big radio and TV personality) and an E.R.A. racing driver. In ‘This is Your Life’, Cotton referred to some of the hair-raising episodes of this period, when both were temporarily grounded for low flying!! Demobilised in 1919, Shaw began a motor cycle agency in Belfast and then entered the Isle of Man 1920 TT Races, riding a 500cc Norton. It was won by Tom de la Haye on a Sunbeam. Shaw was 7th. Beating experts like H R Davies, Freddie Dixon and Graham Walker. A magnificent start to a racing career, the press were already commenting on his meticulous preparation, his steady calm and unflurried riding. To make up for his placing in the TT, he made fastest time in the 500cc class on the Kilometre speed section on the Douglas promenade after the racing had finished. 1921. Began with the 50 and 100 Miles Championships on the Magilligan Sands, where Shaw won the coveted Norton Cup presented by ‘Pa’ Norton himself, and collecting the 100 miles Championship. He competed in most local road races and hill climbs, again distinguishing himself with Fastest Time of Day at these events. 1922. In the Belgian Grand Prix, Shaw was 4th in the 500cc Class on a Norton, using this same machine for the French Grand Prix. In the Ulster Grand Prix he retired with a front wheel puncture on lap 5. In the Senior I. O. M. TT, he retired with engine trouble on lap 3. It is interesting to note that he was co-driving with Kaye Don at a record-breaking session at Brooklands earlier in the year in an A.C. Car. 1923. Shaw finished 7th in the TT ahead of Tom de la Haye and Bennett, while the Norton team of Shaw, G M Black and Simister won the team prize. In the Leinster ‘100’ he was 3rd on handicap, captaining the Norton team. The Ulster Grand Prix was won by Wal Hanley (Rex Acme) Shaw 2nd (Zenith) and Joe Craig 3rd (Norton) Owing to a scoreboard error, Shaw was declared the winner, the crowds were delighted and he had just been congratulated by the Lord Mayor when the error was discovered. Shaw took the sad disappointment like the great gentleman and sportsman he was and rushed over to congratulate Wal Hanley, adding to his popularity, which was, at this time, unassailable. 1924. In the 500cc class Shaw was now producing outstanding performances, his high standard of preparation, his level of excellence in all his events – indeed his personal performances were often the criteria by which the performance of other less competent riders was judged. He was a super tuner, and he knew how to coax the best out of his machines without damaging his engines. Pit stops, which were frequent in those days, were practised to perfection. R H Wright, the International timekeeper, told me that Shaw and his regular pit attendant, Harrie Palmer (many years Hon.Sec. Ulster Motor Cycle Club), would practise outside Shaw’s garage in Belfast, until they achieved perfect harmony in all their movements connected with pit stops. 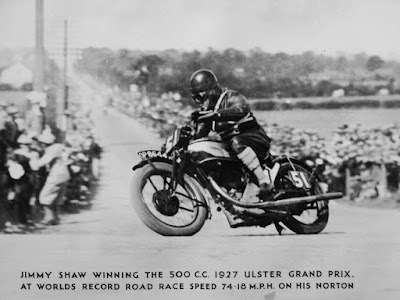 An outstanding, and at this time an International event, the Taileann, motor cycle races at Phoenix Park, Dublin, before a crowd of 40,000 spectators, Shaw won and according to local press, gave an outstanding display of his abilities on two wheels. He did not have any success in the TT Races of this year – in the junior race his machine was a Zenith. In the Portmarnock races, he finished 3rd to a win by Stanley Woods. 1925. The Norton team for the later half of 1924 and 1925 was Alex Bennett, J W Shaw, S Woods, J Guthrie and J H Simpson – that was the full team for Junior and Senior races. He won the Ulster Grand Prix of 1925, then a sealed handicap race, after a ding dong battle with Joe Craig. Shaw, now 33 years of age, was the outstanding Ulster hero, riding better than ever – it was estimated that at least one person out of every house in Ulster was present to see the great man make his and their day at the Clady Circuit. It should be pointed out that sand racing in Ireland was equally as important as road racing is today, where wet and dry conditions required different special skills, tyres, gearing etc. The important Championship Races were held on the Magilligan Strand, adjacent to Portstewart, consisting of 5, 50 and 100 mile races. Shaw won more championship races here than any other rider. Woods and Craig were frequent rivals. Shaw’s race time then was calculated to be 72 mph. Mention of the Norton team reminds me that Alex Bennett, born in County Down, J W Shaw, Belfast, Joe Craig, Ballymena and Stanley Woods were all Irishmen!! 1926. In the Ulster Grand Prix, Shaw did not have the same good fortune as in the previous year. He retired with pre-ignition trouble. In the French Grand Prix he made fastest lap, Bennett winning the race. Shaw in spite of all his commitments in International racing, still found time for local hill climbs and as many of the “100”s as he could manage, finding himself with the honour of scratch position in handicap events. 1927. In the Senior TT, Shaw finished 4th.to a win by Bennett. However, Shaw was riding a push rod Norton engine – his OHC engine had been damaged in practice, but he still beat Graham Walker (Sunbeam) and Freddie Dixon (HRD). Craig retired on lap 6, Woods on lap 5, both on OHC engines. In the Temple 100, Shaw finished 2nd. on a 350 Velocette. However, his greatest personal victory was to win the 1927 open Ulster Grand Prix 500cc class, beating Longman and Woods. Craig led at the end of lap 1, Woods led laps 2 – 8 and Shaw laps 9 and 10. All records were shattered, Shaw creating a new time and speed record for the 500cc class. This again showed the results of his meticulous preparation, skill, consistency and a well-judged race. This was his greatest achievement and proudest victory. Fans were still celebrating well into the Sabbath in Ulster!! For a local man to win the UGP was indeed every Ulsterman’s ambition. 1928. He was to ride in his 10th. TT race. In the Junior, in 4th. place, on a very hot day, he came off at Sulby due to the melting of the tar, damaging his Norton. In spite of injuries, he rode a few days later in the Senior but retired with engine trouble. In the Temple 100 race, won by Percy Hunt, Shaw on a 350cc Velocette, won the beautiful Welsh Challenge Cup and made FTD. He made FTD at Ballydrain and Bannbridge races and in the Ulster Grand Prix, he won the 350cc Handicap race. 1929. His last year in competitive motor cycling, he finished 10th. in the Junior TT winning again the main Championship sand races at Magilligan Strand. 1929 proved to be a watershed in the Shaw family. Jimmy had infrequently competed on four wheels in a ‘Star’, now became an official works driver with ‘Lea Francis’, in company with Kaye Don, W H Green and Sammy Davis. Their cars were front wheel driven and supercharged, competing very successfully, in the TT Races, Brooklands, Phoenix Park, Dublin and the Isle of Man. Now emerged another J W Shaw, Jimmy’s son Wesley, who from photographs at an early age, was never far from his father’s side when he was racing. Wesley was handling motor cycles from the age of 7 – remember those were not the type of machines which today are tailor made for enthusiastic youngsters – they were as used by the professionals, and Wesley was capable of putting them through their paces like an expert. I wonder was it because of his long association with motor cycle racing so early in life that his own racing career was so short? July 1932 saw Wesley (18) compete in his first official race at Ballydrain on a 348cc Norton. He finished 2nd. and made FTD and probably would have won, had he not stopped to change an oiled up plug. Surely a worthy successor to his world famous father and the promise of a great racing career? The same year he was 2nd. in the Temple 100 and finished 9th. in the Carrowdore 100 after a fall which considerably delayed him. In 1933 he finished 2nd. again in the Temple 100 and although he competed in both the North West 200, the Ulster Grand Prix and the Enniskillen 100, none gave him success. Wesley then turned to cars, both trials and racing. From 1934 onwards, he won every major car trial, both North and South of Ireland, including the Round Ireland Car Rally and he was Irish Champion for 3 years. His cars were always Triumphs and his navigator was the lovely Norah Johnson, who married Wesley in 1940. In 1935, the Triumph Car Co. sent over a specially built supercharged Triumph car which Wesley raced at, what was then an International venue, Round the Houses at Bangor, County Down. Mr. Jimmy Shaw (I always addressed him as Mr.) was the Managing Director of ‘J W Shaw’, which had the Triumph car franchise in Belfast as well as a Norton Motor Cycle agency in East Belfast. He was a very successful businessman, while his wife Ethel, a strong hidden asset, played an enormous part in the success of the business and they were both well supported by Wesley. During World War II, Jimmy joined R.E.M.E. (Royal Electrical and Mechanical Engineers) becoming a Major and was awarded the OBE for his services. Wesley was involved with war work locally. After the war, Jimmy and his wife emigrated to America while Wesley joined his uncle’s car business in Belfast. I shall always remember Jimmy Shaw as an elegant, meticulously dressed gentleman, who was a great raconteur of the old days, when he enthralled me with his personal anecdotes and his inexhaustible fund of stories, when I unashamedly should have been attending to my school studies. He was a man of rich and cheerful personality, dignified and courteous – a gentleman with the Old World charm and a champion of ethics. Wesley, who rubbed shoulders with the ‘greats’ of the racing world, was never pompous nor dramatic, but to mad enthusiasts like myself, was a warm and kindly friend, with his many acts of kindness, in allowing me into the sacrosanct of motor cycle racing where many of the greats, both riders and drivers used his extensive garage. Finally, my sincere and grateful thanks to Norah and her family for giving me permission to delve into the racing history of these two outstanding men – father and son.